With a textured surface that produces a 3D effect that imitates glass your eyes won't know the difference. 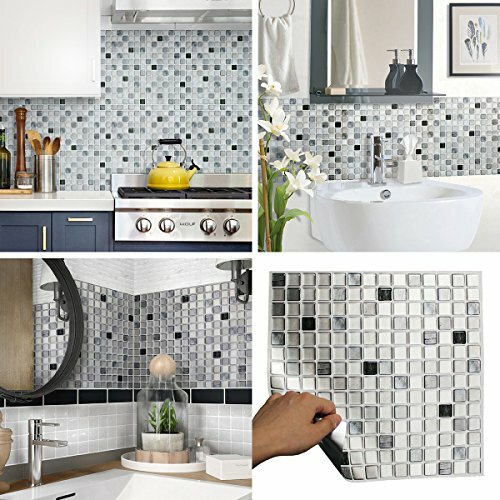 By simply attaching BeausTile, you can complete your tiling needs quickly and conveniently. BEAUSTile has glass-like surfaces and embossed epoxy resin tiles. It looks like a real glass tile or polished marble tile, But it is easy to use because there is adhesive surface on the back. New York and Seoul for quality and safety. Finally, BEAUSTile holds manufacturing technology patent in Japan and South Korea and patent applications in Europe, the United States and China. Fire and moisture retardant, install in Kitchen and bathroom. Please note: 2 pcs of BeausTile are packed in 1 package. BeausTIle sheet is perfect for attaching to the walls behind gas stove and sink. Each sheet is 12.2 by 12.2 inches, six sheets covering approx. 6.2 sq.ft. BeausTile sheet has a transparent and smooth glasslike tile surfaces gives your home interior a stylish accent on plain walls. BeausTile sheet is good for DIY furniture, kitchen and bathroom walls, countertops and table as well as various home accessories. Use scissors or a cutting blade to cut the sheet to your designed size. BeausTile sheet does not contain noxious ingredients such as formaldehyde, phthalates, and cadmium. It the sheet gets dirty, simply clean with a wet towel. If you have any questions about this product by BEAUS TILE, contact us by completing and submitting the form below. If you are looking for a specif part number, please include it with your message.